The Digital Visual Interface (DVI) is a video interface standard covering the transmission of video between a source device (such as a personal computer) and a display device. The DVI standard has achieved widespread acceptance in the PC industry. As of 2012, new devices almost always support either DVI or its related standard HDMI, with the familiar VGA port provided for backward compatibility, if at all. The DVI interface consists of multiple parts. Display identification and capability advertisement is defined over a VESA/DDC interface. The DDC's I²C master in the DVI-source reads a standardized data structure, EDID, from the display device's I²C slave. The DVI specification defines a minimum set of supported video modes for both source devices and sinks (displays), to ensure a basic level of interoperability between any pairing of source and display. Digitally encoded video pixel data is transported using multiple serial bit links. At the electrical level, the links use transition minimized differential signalling TMDS. TMDS is highly resistant to electrical noise and other forms of analog distortion, and barring severe noise impairment or cable defect, transports the pixel data bit-for-bit accurate across the cable. When a source and display are connected, the source first queries the display's capabilities, by reading the monitor EDID block over the I²C link. The EDID block contains the display's identification, color characteristics (such as gamma level), and table of supported video modes. The table can designate a preferred mode or native resolution. Each mode is a set of CRT timing values which exactly defines the duration and frequency of the horizontal/vertical sync, and the positioning of the active display area within the sync boundaries, which determines the horizontal resolution, vertical resolution, and refresh rate. HDMI is a newer digital audio/video interface developed and promoted by the consumer electronics industry. Both DVI and HDMI share the same electrical specifications for the TMDS and VESA/DDC links. However, HDMI and DVI differ in several key ways. First, HDMI lacks analog VGA compatibility, as these signals are absent in the HDMI connector. Second, DVI is limited to the RGB color space, whereas HDMI supports both RGB and YCbCr. Finally, HDMI supports the transport of digital audio, in addition to digital video. An HDMI source differentiates between a legacy DVI display and an HDMI-capable display by reading the display's EDID block. To promote interoperability between DVI and HDMI devices, both HDMI source components and HDMI displays are required to support DVI signalling. From a user's perspective, an HDMI display can be driven by a single-link DVI-D source, since HDMI and DVI-D define an overlapping minimum set of supported resolutions and framebuffer formats to ensure a basic level of interoperability. In the reverse scenario, a typical HDMI-source (such as a Blu-ray Disc player) may demand HDCP-compliance on the display, an optional capability for DVI monitors. Hence, though the display link is technically operable in the sense that the HDMI source can produce a watchable image on the DVI monitor, content policy may forbid the display of HDCP-protected content on the non-HDCP compliant display. Absent this HDCP issue, an HDMI-source and DVI-D display would enjoy the same level of basic interoperability. Features specific to HDMI (such as remote-control, audio transport, xvYCC, and deep-color) are not usable in devices that only support DVI signalling. However, many devices can output HDMI over a DVI output (e.g., ATI 3000-series and NVIDIA GTX 200-series video cards), and some multimedia displays may accept HDMI (including audio) over a DVI input. In general, exact capabilities vary from product to product. DVI's digital video transmission format is based on PanelLink, a serial format devised by Silicon Image Inc. PanelLink uses transition minimized differential signaling (TMDS), a high-speed serial link developed by Silicon Image. 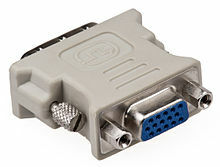 Like modern analog VGA connectors, the DVI connector includes pins for the display data channel (DDC). DDC2 (a newer version of DDC) allows the graphics adapter to read the monitor's extended display identification data (EDID). If a display supports both analog and digital signals in one DVI-I input, each input method can host a distinct EDID. Since the DDC can only support one EDID, there can be a problem if both the digital and analog inputs in the DVI-I port detect activity. It is up to the display to choose which EDID to send. A single-link DVI connection consists of four TMDS links; each link transmits data from the source to the device over 1 twisted wire pair. Three of the links correspond to the RGB components of the video signal: red, green, blue (for a total of 24 bits per pixel.) The fourth link carries the pixel clock. The binary data is encoded using 8b10b encoding. The 8b10b encoding system serves several purposes: it preserves DC balance over time, it generates sufficient signal transitions to maintain receiver bit-alignment (pixel clock recovery), and it provides symbol (byte) alignment. Each TMDS link carries binary data at ten times the pixel clock reference frequency, for a maximum data rate of 1.65 Gbit/s × 3 data pairs for single-link DVI. DVI does not use packetisation, but rather transmits the pixel data as if it were a rasterized analog video signal. As such, during each vertical refresh period, the complete frame is 'drawn' over the DVI link. The full active area of each frame is always transmitted; no data compression is used, and there is no support for only transmitting changed parts of the image. Video modes typically use horizontal and vertical refresh timings that are compatible with CRT displays, but this is not a requirement. The DVI specification (see below for link) does, however, include a paragraph on "Conversion to Selective Refresh" (under 1.2.2), suggesting this feature for future devices. The DVI specification mandates a maximum pixel clock frequency of 165 MHz when running in single-link mode. With a single DVI link, the highest supported standard resolution is 2.75 megapixels (including blanking interval) at 60 Hz refresh. For practical purposes, this allows a maximum screen resolution at 60 Hz of 1,915 × 1,436 pixels (standard 4:3 ratio), 1,854 × 1,483 pixels (5:4 ratio), or 2,098 × 1,311 (widescreen 16:10 ratio). To support display devices requiring higher video bandwidth, there is provision for a dual DVI link. A dual link doubles the number of TMDS pairs, effectively doubling video bandwidth at a given pixel clock frequency. The DVI specification mandates how the dual link may be used. All display modes that use a pixel clock below 165 MHz, and have at most 24 bits per pixel, are required to use single-link mode. All modes that require more than 24 bits per pixel, and/or 165 MHz pixel clock frequency must use dual-link mode. In modes where each pixel uses 24 bits of color data per pixel or less and dual-link mode is in use, the transmitter stripes pixel data across both links; each sequential video pixel is transmitted on alternate links. In modes with color depth greater than 24 bits per pixel, the second link carries the least significant bits of each pixel. The maximum length of DVI cables is not included in the specification since it is dependent on the pixel clock frequency, and hence the video mode's bandwidth requirements (which is a function of resolution and refresh rate). In general, cable lengths up to 4.5 m (15 ft) will work for displays at resolutions of 1,920 × 1,200. This resolution will work even up to 10 m (33 ft) if appropriate cable is used. Cable lengths up to 15 m (50 ft) can be used with displays at resolutions up to 1,280 × 1,024. For longer distances, the use of a DVI booster is recommended to mitigate signal degradation. DVI boosters may use an external power supply. The DVI connector usually contains pins to pass the DVI-native digital video signals. In the case of dual link systems, additional pins provide increased bandwidth allowing higher resolutions and longer distances.Dual link should not be confused with dual display (also known as dual head), which is a configuration that involves a single computer connected to two monitors. In addition to digital, the DVI connector includes pins that carry an analog signal. This allows a VGA monitor to be connected with a passive plug adapter and offers a universal solution for the DVI interface. The analog pins are the four that surround the flat blade as shown on the left-hand side of the diagrams for DVI-I and DVI-A. Some retail computers come with both a VGA and DVI-D video output. Without the four analog pins present on the DVI-D connector, a VGA source cannot be attached. 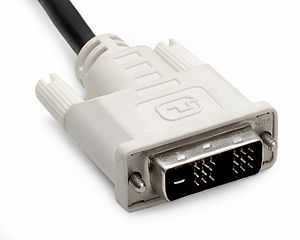 The DVI-D and DVI-I connector includes provision for a second data link. As of 2012 this second link was supported by many ad-on graphic cards, including some under $40 to connect to high resolution (like 2560x1600) monitors. It may not be supported by on-board solutions. DVI is the only widespread video standard that includes analog and digital transmission options in the same connector. Competing standards are exclusively digital: these include a system using low-voltage differential signaling (LVDS), known by its proprietary names FPD-Link (flat-panel display) and FLATLINK; and its successors, the LVDS Display Interface (LDI) and OpenLDI. Some new DVD players, TV sets (including HDTV sets) and video projectors have DVI/HDCP connectors; these are physically the same as DVI connectors but transmit an encrypted signal using the HDCP protocol for copy protection. Computers with DVI video connectors can use many DVI-equipped HDTV sets as a display, but only computers whose graphics systems support High-bandwidth Digital Content Protection are currently able to play content that requires digital rights management. USB signals are not incorporated into the connector, but were earlier incorporated into the VESA Plug and Display connector used by InFocus on their projector systems, and in the Apple Display Connector, which was used by Apple until 2005. The DMS-59 connector is a way to combine two analog and two digital signals in one plug. It is commonly used when a single graphics card has two outputs. Note that this is dual display – it does not have the additional pins for the dual link TDMI signals. M1-DA connectors are sometimes labeled as DVI-M1; they are used for the VESA Enhanced Video Connector and VESA Plug and Display schemes. The DVI data channel operates at a bit-rate that is 10 times the frequency of the clock signal. In other words, for every DVI clock there are 10 bits, per channel. Pixel data is encoded using TMDS' own 8b/10b encoding scheme. This scheme has two steps. The first step is to minimize transitions by determining which of two methods yields the fewest transitions. In both schemes, the first bit is always encoded as itself. In one scheme, the second through eighth bits are encoded by XNORing each of them with the bits that preceded them before they got encoded. In the other scheme, the second through eighth bits are encoded by XORing each of them with the bits that preceded them before they got encoded. The scheme selected is indicated in the ninth bit of the code word before it is processed in the second step. If this bit is a zero, the XNOR scheme was used. Otherwise, the XOR scheme was used. The second step is to maintain DC balance. To do this, the nine bits in the code word that was created in the first step might need to be inverted. The tenth bit is set to 1 if this was done. Otherwise, the tenth bit is set to zero. As indicated in version 1.0 of the specification, the clock rate is the same as the pixel rate plus framing overhead, while there are usually 24 bits per pixel. This scheme was designed so that each pixel character contains at most five transitions. The transmitter chooses between the two schemes in order to transmit the fewest transitions as possible for each pixel. The receiver must recover the faster bit clock from the data lines directly through the techniques of clock/data recovery. DVI provides a reference clock while other serial data interfaces such as PCI Express and SATA do not because the bit rate carried by the DVI interface may vary across a wide frequency range depending on the video format being rendered. Serial interfaces that do not separately carry the reference clock typically run at a few well-defined frequencies which are easy to distinguish (e.g., 2.5 and 5.0 Gbit/s for PCI Express and 1.5 and 3.0 Gbit/s for SATA) which can be generated precisely at the receiver. The data enable signal encodes the type of data being sent; high means pixel data, and low means control data. Data of the opposing type is ignored. The DVI specification includes signaling for reducing power consumption. Similar to the analog VESA display power management signaling (DPMS) standard, a connected device can turn a monitor off when the connected device is powered down, or programmatically if the display controller ("graphics card") of the device supports it. Devices with this capability can also attain Energy Star certification. IEEE 1394 is proposed by High-Definition Audio-Video Network Alliance (HANA Alliance) for all cabling needs, including video, over coax and/or 1394 cable as a combined data stream. However, this interface does not have enough throughput to handle uncompressed HD video, so it is unsuitable for applications that require uncompressed HD video like video games and interactive program guides. In December 2010, Intel, AMD, and several computer and display manufacturers announced they would stop supporting DVI-I, VGA and LVDS-technologies from 2013/2015, and instead speed up adoption of DisplayPort and HDMI. They also stated: "Legacy interfaces such as VGA, DVI and LVDS have not kept pace, and newer standards such as DisplayPort and HDMI clearly provide the best connectivity options moving forward. In our opinion, DisplayPort 1.2 is the future interface for PC monitors, along with HDMI 1.4a for TV connectivity." Since 2008, PC manufacturers have gradually upgraded the PC's controller to support HDMI-output in addition to DVI. Due to electrical and pin compatibility between the DVI and HDMI, only a simple passive adapter (or DVI-D to HDMI cable) is necessary in order for the PC to output HDMI to a compatible HDMI-display (such as a television), and take advantage of HDMI features (such as audio output).